so, yes, i finally finally finished this cardigan. and i am quite in love with it. all notes and details about the pattern, yarn, buttons and modifications i made can be found on the ravelry project page. it does need to cool down a bit outside for me to really enjoy it though. can't wait to walk through the woods with it on a sunny autumn day! and the best thing about finishing a knitting project? casting on a new one the same day! i'm totally in love with this color wool and the sweater looks great! i love asymmetrical clothing. 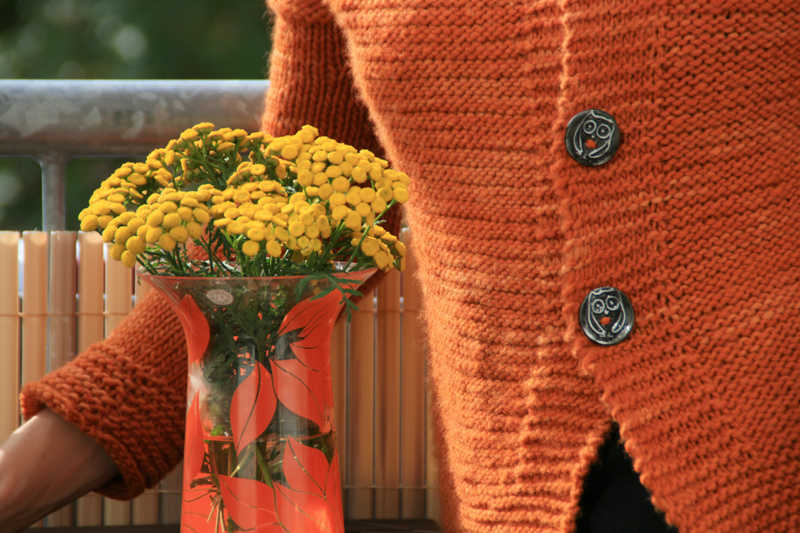 Wow, that is such a beautiful cardigan! i really admire your knitting skills- I am hoping to start learning how to knit sweaters soon. :) Your sweater is so pretty and unique! Really great job! it's so beautiful! the color (one of my personal favorites) looks AMAZING on you! very pretty. you are so very talented! i love to crochet, but i've never attempted anything larger than a newborn sweater. Well done! It is very flattering and you look great in it!